I’ve changed the title of this post to bring out something that seemed to me striking. It seems to various agencies devoted to studying, curing and preventing cancer are saying that alcohol is a carcinogen when consumed in amounts that in fact many people do consume it. Maybe everyone else has gotten this, but it isn’t showing up in, for example, discussions about whether to raise the estimates of the healthy intake of alcohol in the UK. Of course, there are lots of possibilities here about who is right or wrong, and it would be great if anyone has any insight here. So here are some facts about recommendations and guidelines regarding the consumption of alcohol. In the States, the Center for Disease Control recommends at most one drink a day for women and two for men. More than this is heavy drinking, which has a lot of health risks. Now in fact the difference here from the US is not that great. 2 units of spirits for the UK appear to be about 1.7 ounces, which one unit for the US is 1.5. Still, the UK is going to increase theirs, it seems. Now, one can certainly get one’s head around all this. Americans disapprove of drinking, and Europeans and the Japanese do not. Roughly speaking. But here’s the reveal. According to the American Cancer Society, research shows that consuming alcohol is connected to getting cancer. Limiting alcohol may lessen one’s risk for cancer. The limits are these: women one drink and two for men. There is no doubt that alcohol can cause seven types of cancer. The more you cut down on alcohol, the more you reduce your risk of cancer. There is limited risk if you only drink a little – such as one small drink a day for women or two for men. You don’t need to be drunk to increase your risk. Drinking and smoking together are even worse for you. The consequences of drinking too much alcohol go well beyond the evening’s embarrassing antics or the morning’s hangover. Scientific studies have confirmed that alcohol can also cause cancer. There is, it seems to me, a shocking disconnect in some of these figures. A reader has sent us an interesting question about how women show up in philosophical examples. He wishes to remain anonymous, so responses here please. I was wondering if anyone has conducted any kind of study (even informally) of women, both real and imaginary, featuring as examples in philosophy papers. I ask because I’ve recently gotten annoyed with the amount of times that women feature only in passive capacities, or as victims, in papers that I read. Thinking about the field I am most directly acquainted with, it’s really hard to think of examples of women featuring in examples in more positive ways. Because of the size of the literature it’s hard to know whether this is commonly occurring, or just common in some subfields. 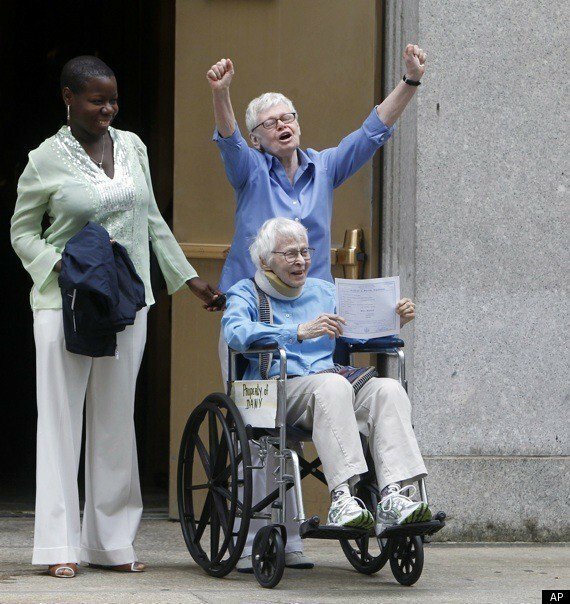 The first same gender couple to get married in NY! Such a beautiful picture of love, joy (and justice!) it makes me choke up. And along the way, doing serious damage to stereotypes of older people and the disabled. But of course they *are* going to destroy the institution of marriage, the family, society…. So asks Bug Girl, a terrific feminist science blogger, in a thoughtful exploration of Google’s “no pseudonyms” policy and what the policy means for “women, LGBT folk, and civil servants.” You can read Bug Girl’s post here. It got me thinking about when anonymity serves women’s interests well–the recent discussions of anonymous review came to mind–and when it doesn’t. While everyone knows that philosophers love the occasional blogosphere shitstorm, this latest one has been more than a little uncomfortable and upsetting for a lot of people. So to cheer ourselves up on this Monday morning, let’s use this blog to remind ourselves of some of the awesome female philosophers who are out there making philosophy a better place for women. One thing that struck me about the comments on this post was how many people said that Jenny Saul makes it easier to be a woman in philosophy. She does, as do many other women out there – and that’s a helpful thing to remember sometimes. So this post in an invitation. Please comment and tell us about a woman who has made it easier to be a woman in philosophy (either for you personally, or for women you know). Or tell us about several such women. The more the merrier, really!